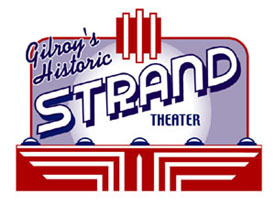 The Strand Theatre is one of Gilroy's most historic buildings. When recently purchased by an East Coast theatre producer and an extensive remodel began, he realized they needed a new logo that would reflect multi-faceted new theatre. Seal combined the art deco historic marquee lettering with the feel of the stage to capture exactly what they were looking for.